For now, I am using a random flood fill with as many starting points as I want plates. create a random seeding point and store point in each plates list of points. loop over each plate and add an adjacent, empty point to it. This gives acceptable results, but takes very long! 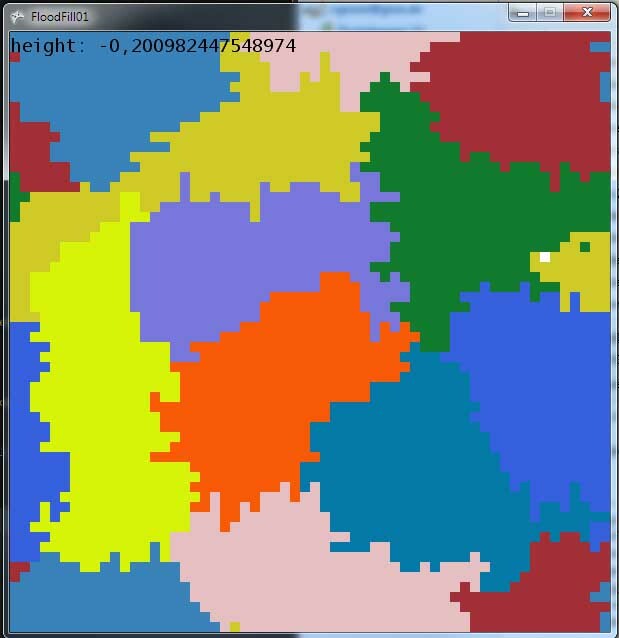 With 6 plates, a map of 100x100 tiles/points/cells takes 3 seconds, 200x200 takes 50 seconds, 500x500 takes forever. The more plates, the quicker it is. Is there a quicker way to get a good result? Maybe something with Voronoi? O(n*m) runtime is typical with something like this. Your implementation is a bit excessive, however. The real question is, What is making your O(n*m) algorithm take so long? Why bother to run through every map cell for each influence? It would be faster to have each starting influence also specify some random maximum radius within which it could affect map cells. At the start, store the position of the influence AND it's radius. 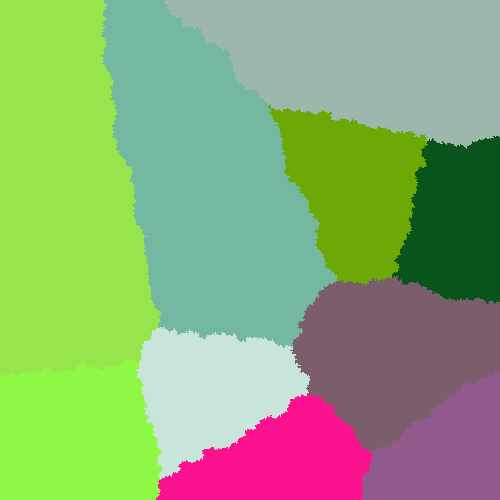 Then, for each "plate" (influence), attempt to write cell color only within that radius. 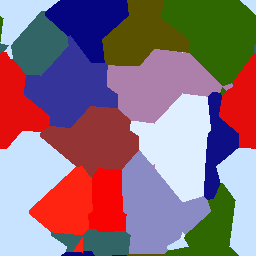 Cell-based Voronoi will similarly be O(n*m) if using a similarly naive approach, since you must run through all Voronoi centres for all map cells. Radius-based distance checks use a square root which can be relatively costly; use either a radius look-up table to avoid square root calculations, or use rectangular [x,y] bounds range-check for early termination, only checking radius / sqrt once you fall within those [x,y] bounds. Optimal average radius is going to be based on your average influence point spacing... this is something I leave for you to figure out, as it depends on how you have distributed your initial points. Some empty cells will remain since radii will not cover all map cells. You can fill these out relatively cheaply in a final step, by taking the colour of a random, populated neighbour. pack your data tightly and in a cache-friendly fashion (anything from using simple sub-grids to a Hilbert curve or Z-curve). 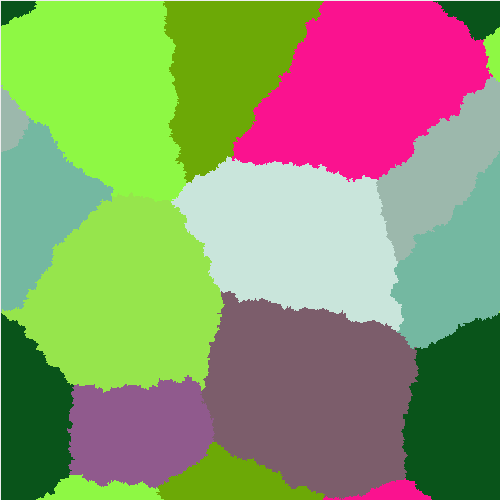 Unfortunately, to get to closer to O(n), you would need a continuous function that creates distinct regions of adjacent, uniquely-coloured cells. If anyone knows of such an approach, I would love to hear about it, but I know of no such algorithm. There may be a way to adapt Perlin noise (continuous function) to do this, but not without a significant amount more effort and complexity. Usually, simplicity is best, so I suggest sticking with and optimising your current nested approach. Vectorised (SIMD) and parallelised (multi-core) processing are also options if your language is sufficiently low-level or does these transparently. The only other thing I could suggest if you are using a higher-level langauge (e.g. HTML5 JS or Unity) is to write generation functions in a lower level language and tie them in as e.g. shared libraries to maximise performance in those critical sections. Instead of iterating over all plates, consider only those empty cells that could possibly be filled: namely those that are adjacent to at least one already filled cell. 1) Keep track of all unfilled cells that have at least one adjacent filled cell. 2) Select one of these unfilled cells. 3) Select one plate from all plates adjacent to the cell. 4) Make the cell part of the plate. to a plate yet to your data structure (if they haven't been added before). Here, I'm using a second grid (claimed) and an array (cells) in which I keep track of all cells that have at least one adjacent plate. The cells array basically functions as a list for all such cells from which the next cell to assign is selected at random. The claimed array allows for fast checking of whether a cell has already been added to cells or not. The main loop is in fill: first, some random starting points are determined for each plate. Then a loop fills all remaining cells of the grid. The real smarts is in setCell: this method does not only update the grid itself, but also the "claims" array for the cells immediately above, below, left of and right of the given cell. A third method selectCell randomly selects for a given cell one of the plates that made a claim for that cell. Not the answer you're looking for? Browse other questions tagged 2d algorithm procedural-generation random or ask your own question. How to devise an algorithm for a person being on a walk? How to round points to an arbitrary grid on the surface of a cube?